WISP review by Joe Falaschi (E-vergent Wireless). This post is about an excerpt from the Preseem webinar video featuring Joe Falaschi back in Sep 2018. For full video, click here for Preseem webinar archives. 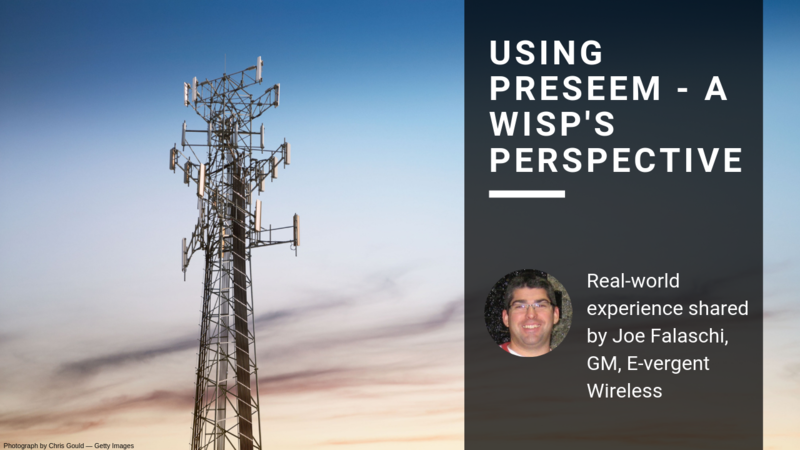 We at Preseem take pride in helping Wireless Internet Service Providers (WISPs) provide a better quality of experience (QoE) to their subscribers. Additionally, having happier customers leads to lower churn, reduced support costs and increase in revenue. And that is exactly what this post detailing a WISP review is about. In the video post here, we have Joe Falaschi from E-vergent Wireless, a WISP based out of Mt. Pleasant, Wisconsin. Joe shares his experience of using Preseem and the impact it has had on his network and business. In the 10-minute video, Joe starts off by giving an introduction of his business and network. He talks about the company’s journey from dial-up internet in 1995 to wireless in 2001. He further shares information on the wireless gear E-vergent uses as well as the billing platform. Importantly, Joe mentions how they evaluated DPI-based solution as well before going for Preseem. He mentions the easy hands-off approach to traffic management that comes with Preseem as one of the key factors along side affordability. Furthermore, he credits the on-boarding and support team for a smooth integration with his network and billing system. One of the core ways the E-vergent team, as described by Joe, uses Preseem is for the support function. He mentions the value of having traffic graphs, real time and historical data and QoE metrics for each customer while the support team is on call. Furthermore, there’s no need for guesswork when it comes to troubleshooting AP issues. Preseem helps E-vergent pinpoint the source of QoE problems proactively instead of shooting in the dark. Moreover, proactively monitoring and optimizing QoE with Preseem allows E-vergent to save on unnecessary customer service calls and truck rolls. As customers get happier with E-vergent’s service, there has been a noticeable change in their online reviews on Facebook and Google leading to more business. In this part of the video, Joe shares information on how E-vergent used to implement subscriber plan speeds using rate limits in radios before deploying Preseem. Additionally, he comments on how throwing more bandwidth to solve QoE issues isn’t a sustainable method. Furthermore, He compliments how Preseem takes care of QoE issues on maxed out connections. In conclusion, Joe shares the real impact deploying Preseem has had on lowering their subscriber churn and adding $27,000 in revenue in just six months. With some help from Gerrit on explaining E-vergent’s customer churn data, he concludes the positive impact deploying Preseem has had on their network and business, to the tune of over $100 K over a year and 126 saved customers. Just click on the video below to watch Joe Falaschi, GM, E-vergent detail his experience of using Preseem and the positive impact it has had on his fixed wireless network and business.